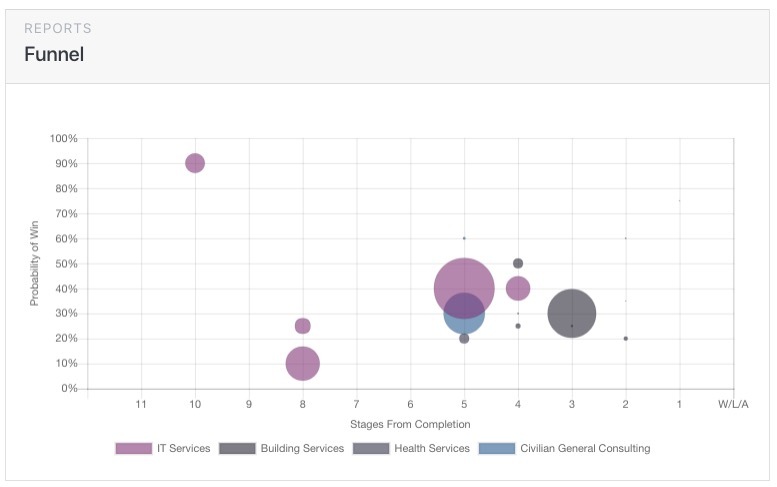 GovTribe offers useful and easy-to-understand reporting tools focused on your business development Pipelines and Pursuits. We call these Pursuit Reports. This short video covers pipeline best practices and the pursuit reporting capabilities. Below that is a written walkthrough with screenshots. 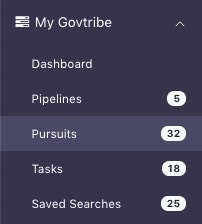 You can access your Pursuit Reports by first navigating to Pursuits under My GovTribe in your side menu. There you can view a list of all of your Pursuits across all Pipelines. The filters panel on the left side of the screen allows you to filter to a sub-set of your pursuits. 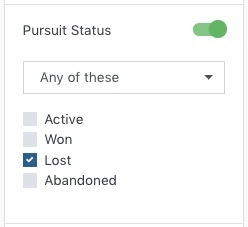 For example, you can filter by Pursuit Status - if you perhaps want to do an after-action review of all the pursuits that you Lost. 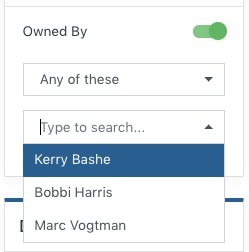 You can filter by Owner, if you want to review all of the Pursuits assigned to one individual on your team. You can filter by all relevant dates, by the value of the pursuit, but the set-aside, and a number of other factors. You can also filter based on keywords by just entering your keywords into the main search bar. The Pursuit search page is a way to quickly and easily find a pursuit, or to generate a list of your Pursuits for any purpose. You can then export the list to Excel, if you want to use your Pursuit information offline. To view live, interactive visualizations of your Pursuit data, click on the Reports tab at the top of the search results area. The Funnel report is a visualization of your in-process, active Pursuits. Each bubble on the chart corresponds to one of your Pursuits. The size of the bubble indicates the dollar value of the Pursuit, relative to others. If you hover over one bubble, you will see the name and estimated value. The horizontal X-axis of the chart shows the number of stages across all Pipelines, counting down to a terminal state (i.e. won, lost, or abandoned). So the further you move to the right, the close the plotted pursuit is to "completion". The vertical Y-axis shows your P-Win - your estimate of your percent chance of winning the bid. So the higher up the plotted pursuit, the higher chance you have estimated for winning the associated contract (or grant). In general, you would expect your plot to be roughly a vertical line moving from left to right. That would indicate that you are focusing your resources on Pursuits which you believe you are positioned to win. Bubbles that deviate from the expected pattern are ones that may require some attention during pipeline review meetings. Outliers in the upper left quadrant should raise questions about high levels of confidence for early stage opportunities. Perhaps it is a renewal of a contract that you already hold, or a sole-source award. Or perhaps the person responsible for the Pursuit has not done their due diligence and properly estimated the P-Win. Outliers in the lower right quadrants should raise concerns about improperly allocated business development resources and manpower. I.e. should we be be spending time on bids be believe we have very little chance of winning? 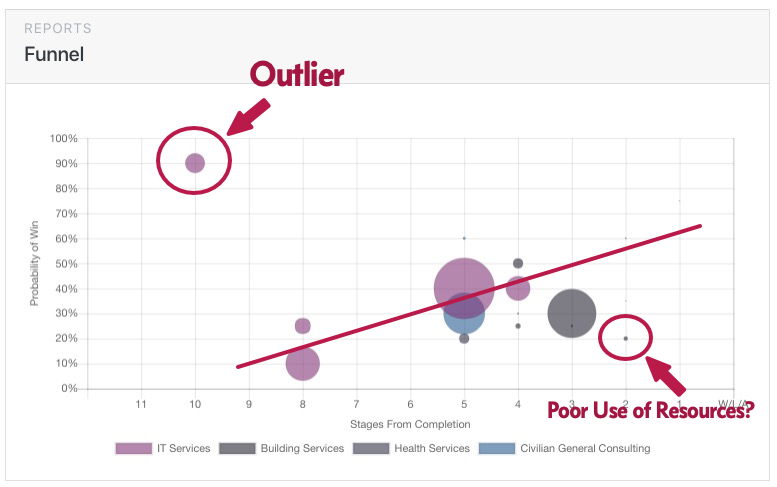 There are a number of helpful stories a funnel chart can communicate, and building a regular pipeline review meeting around this chart can help your organization to develop good best practices with regard to P-win estimation and bid/no-bid decision-making. 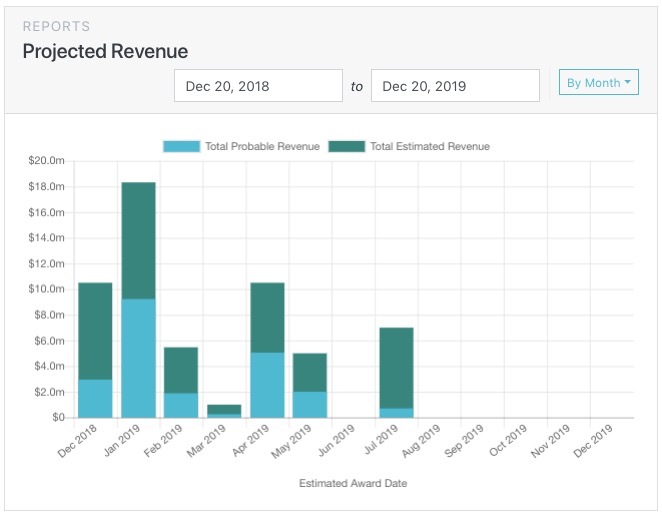 The Projected Revenue report is a column chart that illustrates your expected future revenue by month, quarter, or year (FY or CY). The purpose of this chart is to help your team in assessing the estimated and probable future value of the active Pursuits in your Pipelines. The third Pursuit report provides a visualization and leaderboard-style summary of your completed Pursuits - those that you have Won, Lost, or Abandoned. The column chart illustrates the total dollars won, lost, and abandoned by month, quarter, or year (FY or CY). The donut chart shows the same information, but in aggregate for the entire period indicated by the date ranges at the top of the chart. The inner ring of the donut chart summarizes the number of pursuits won, lost, or abandoned. The outer ring shows dollars. The bottom half of this report shows a breakdown of the pursuits you have won. 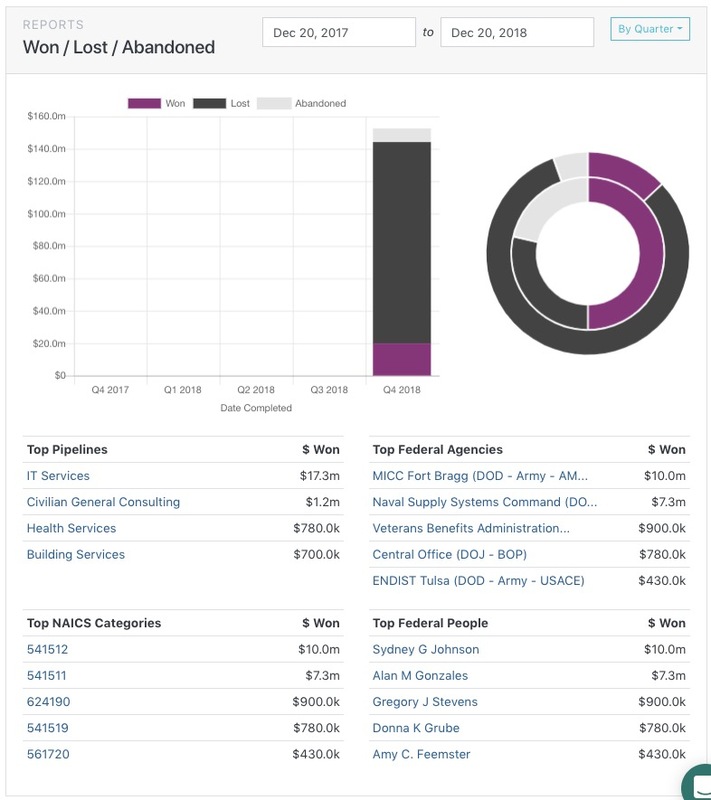 So you can see which Pipelines, NAICS categories, Agencies, and Contracting Officers that have been must successful for your business.